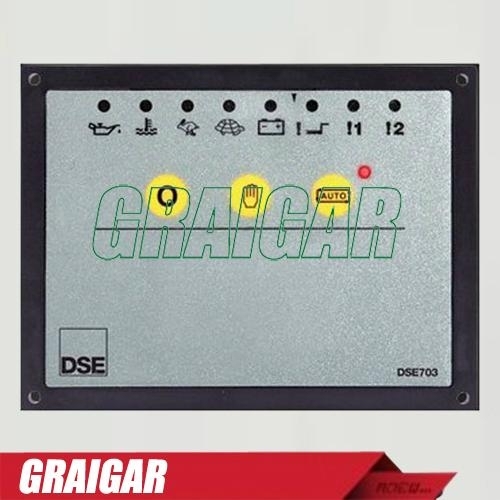 The DSE703 is an Automatic Start Control Module that offers an excellent range of engine monitoring and protection features. The module has been designed to monitor over speed, under speed, high engine temperature, low oil pressure, battery charge fail and fail to start. The module also has two configurable auxiliary inputs and a configurable engine pre-heat timer. When the module detects a fault condition it automatically shuts down the engine, indicating the exact fault via LED. The Generator Controller has also been designed to automatically start the engine within three attempts and crank disconnect. MANUAL – This mode is used to manually start the engine. AUTO - This mode is used to automatically start the engine. The module will be started by the remote start signal. STOP – This button is used to stop the engine when it is running in either manual or automatic mode.